Our HAP was one of our main focus this quarter. For my HAP, I worked in a group with other students to make a proposal for a pop up show. We want to show people what a garden and adult park can do for the community. We would ideally love to do it at bayside but we are still in the process of planning our where it would be ideal. We would to make the event and permeant garden to be a mutigenerational site. For our poster, Danyi and Rhiannon made a great map about what areas are in the most need or would benefit from this program. Our HAP is definitely something that we are all committed to make it a possibility. We applied for some scholarships so we are waiting to see the approval of those application. But I think we have many opportunities where many people would be interested in what we are trying to create. At the beginning of class, we had our debrief from our LEG at the LGBT Community Center. As usual everybody seemed have a great time at the community center and interaction with all the seniors except for chase. Chase had an interesting conversation with one of the seniors at the center. Chase shared his talk that he had with holly. It was interesting to see this point of view that she had about what we as a cohort were doing. Usually many seniors tell us how wonderful we are doing and that they are proud that we care about connecting with the community in san Diego and the older generation but holly didn't necessarily think what we were doing was helpful. She seemed to think by us doing these hypothetical neighborhoods we aren’t making a change. When I first heard this, I was a little upset because we always try to have activities that can make a positive change in the community but after hearing her story, I understood why she was so upset. I think she wasn't upset at us but just at the system and government. Chase talked about how she was homeless and her friend died and that she was suffering though health problems. I think it was great that chase was there just to be able to hear her vent. I think she really just needed someone to listen to the concerns she had. Today we went to the 50 & better program at the LGBT Community Center. This was the first time we have been to this center and I was very excited. My first impression of the community center was how big and beautiful it was. Even though we only went into the main ballroom the center seemed like it had many other areas. Every senior at the center was very kind and welcoming and interested in the activity that we were going to do with them. First, we got to bond with them and talk to them about their lives. I got to talk to a group of ladies that told me how they are all best friends. They had been living in San Diego for over 20 years! We talked about where they grew up and careers they had. It’s interesting that even though there is a big age difference we still have many similar concerns such as the rising prices of hosing. After getting to socialize with the seniors, we got into our third LEG activity. 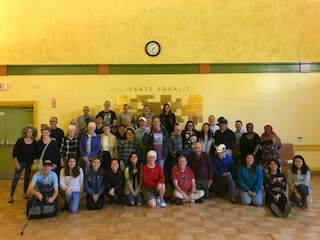 The seniors at this center had many interesting new ideas that other seniors at Casa de Mañana and bayside didn't mentioned. There was one that defiantly stood to me the most which was having subsidized lyft or uber. They said that buses and shuttle transportation was nice but it takes too long and it is very inconvenient when going grocery shopping or have to run any other errands. I think sometimes we think that seniors can’t work technology or know to use “new” apps such as uber and lyft. They also talked about having a public service draft which would involve having people over the age of 18 enroll to volunteer with the aging community. 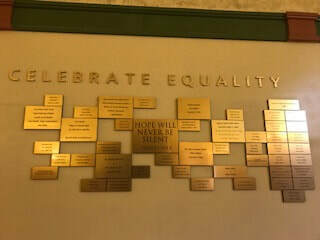 Overall it was a great experience going to the LGBT center. I would have loved the opportunity to be able to go more times to the center. I found it so nice that all the seniors were excited to share with us their lives and stories. 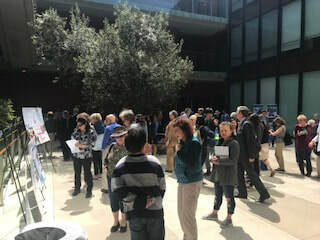 Many told us that they themselves went to UCSD as well. Wow we had a busy class day today. We had many things in the schedule to do today in class. At the beginning of the class we had a presentation by professor Sue Peerson to help us with our posters for our HAP’s. Her lecture was very informative on how to make a poster appealing and how to structure our posters. She showed us many examples on Do’s and Don’ts on the color, font, and structure. After the presentation, we divided up into groups for each project since it would be too many people to just work on one poster. I am excited to put our poster together to show them at the Healthy Aging Symposium. ​Once we were done with the presentation by professor Peerson, we proceeded to debrief both our LEG’s at Casa de Mañana and Bayside. It seems like everybody had a great experience with the activity we did with the seniors. The seniors from both centers had similar ideas such as having more intergenerational events and having city councils. I thought it was interesting that many of the ideas were the same, even though they live in different areas and have different needs. After we were all done we had our 3rd reading discussion that was led by Danyi, John, and Jessica. They did a really great job with their discussion questions. I found this week readings were interesting. I was so glad to get to go back to bayside this quarter. I enjoyed being able to do Zumba with the seniors. They always seem very happy to see us and be able to do these activities with us. When we first arrived there, we didn't have enough time to talk to the elders since Zumba started right away. Zumba was fun as usual; the instructor is great and energetic. She always gets everybody to get out of their shell and really gets everybody moving. ​After we finished Zumba, we all gathered for a picture with everybody. We also had a potluck with the seniors. They are always welcoming and offer us food and are exciting to interact with us. Everybody spread out so we had a good mixture of seniors and student. We also had our second learning exchange group (LEG) at bayside. We had a great time talking to them about what the seniors wish to see in an interactive community. The biggest problem that they had with their current neighborhood was the amount of time allotted to cross the sidewalk. They started telling us how they have had friends who have gotten hit by cars because they don't have enough time to walk. They also talked about how they are worried about the safety between the cars and pedestrian. They believed they need more barriers between the sidewalks and road. I think by having a barrier between the road a sidewalk is a great idea for any community not only does it help seniors but anybody of any age. I had a great experience going to the bayside community center. This is a special place because I think they try to include anybody despite their age. I wish we would have had more time for the LEG because I feel they provide a different point of view then the other senior communities. In class, this week we had our 2nd reading discussion. This week I presented my passage alongside Chase and Micah. Our topic this week was about the social and psychological contexts of aging. I did my discussion on the poem Mother to Son by Langston Huges and When a House Is Not a Home by Christopher J. Elias. These Passages were both very moving for me. My favorite one was the passage by Elias because it explained the struggles of being an elder homeless. I feel like at times we unconsciously judge people who are homeless without realizing that they could be stuck in this cycle of being homeless. We had our first reading discussion from Worlds of Difference. The reading for this week was about aging in individual, sociocultural and historical contexts. I enjoyed all the passages that Rhiannon, Elizabeth and Jackie discussed in class. They definitely brought up questions and discussion that made me think about my life and experience. The question that I though started a great discussion was if there was a major event that has shaped our life. It is interesting how even though we are all similar in age our memory of an event or how it affected us is different. ​During class, we also got a new assignment about debunking stereotypes. For this project, we have to come up with a creative way to express a positive view on elders. I was thinking about coming up with an infographic to represent that the misconceptions that elders are physically inactive, depressed, and cannot live alone because they need people to take care of them. First class of the quarter! Today, we reviewed what we have planned for this quarter. I think this quarter will be a bit more stressful since we will be planning our own HAP’s and will have to work on them for the rest of the quarter. Even though it seems like there are some big projects this quarter, I am excited for all our site visits. I am excited to go back to bayside for Zumba but also to go to a new site visit at the LGBT center. In class today, we got a chance to talk to our group and discuss more about what we are thinking for our HAP. For our HAP, we want to continue one of the formers students HAP to create a community garden for the elders in centers such as the one created in St. Paul’s Plaza. We also came up with the idea of creating a pop up show that we would ideally want to have at bayside. Unfortunately, since bayside is going through some changes they no longer have their garden. Our HAP project is a long-term project but I can’t wait to see our hard work pay off. The HAP at the Gray and Mary West was amazing! We had so much activities such as a photo booth, raffle prizes, and awards. Our theme for the senior prom was St. Patrick’s Day. We had only a short time to decorate the room but we had so much help. Many of the senior volunteers helped us set up which was so helpful and nice from their part. I had many favorite parts from the prom. I think my favorite part was announcing the prom king and queen. The winners were extremely happy. They got to have their first dance and be photographed. I got a chance to talk to the queen and was saying how this was one of the best times she has had in a while. She was saying how she had never won queen before. She was taking so many pictures at the photo booth with the king it was so great to see how happy she was. There weren’t many people at the photo booth at first but once we spread the word about it, it got so busy. So many seniors were taking picture with their friends but they also wanted to take picture with us to keep for memories. One elder even had saved pictures he had with former LCSer. The raffle prizes were also a big hit. So many were so grateful to win prizes. Also at the end of the prom we gave everybody goody bags. They were so surprised that after the raffle prizes and everything they still got something at the end. It was a fun and amazing experience to have been able to put together this events for the seniors at the Gary and Mary West Center.